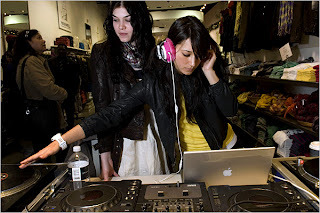 Meet the new style gurus: female DJ's. At least that's what Ruth La Ferla observes today on her article on the NY Times. Here is a snippet from it. Excellent. There's language now for that particular style. Very urban and industrial chic. One of the DJ's in the article actually pointed out that being a DJ in modernity is not that difficult and that to be noticed/considered as one, a certain sense of style has to be created. Form functional to content, anyone? Hmm, I can almost see you doing that too for fun!